The cornea is the dome shaped window in the front of the eye. 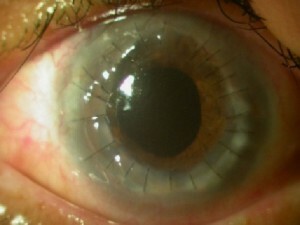 It must be clear and round if we are to see through it.If the cornea is not clear and round, it is often possible to transplant it with another one from a person who has died. The cornea has a few different layers, and often only one of these layers needs to be transplanted in order to make the cornea clearer or more round. Reasons to transplant the cornea include corneal swelling, a very opaque corneal scar, a severe corneal infection (as shown in photographs) and keratoconus, a disease in which the cornea thins and loses its round shape. These are before-after photographs of the eye of a patient with a severe corneal infection who underwent corneal transplantation.